It’s rather telling of the times we’re living in that woodland “den building” has become an advertised activity. But if that’s what has to be done to get kids playing outdoors, then so be it. 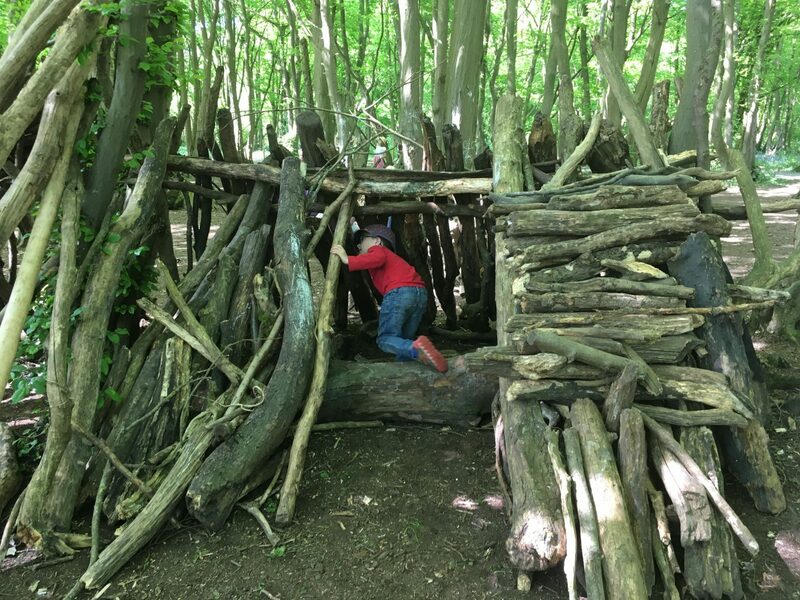 If your offspring require some inspiration for their den building, look no further than Heartwood Forest near St Albans. 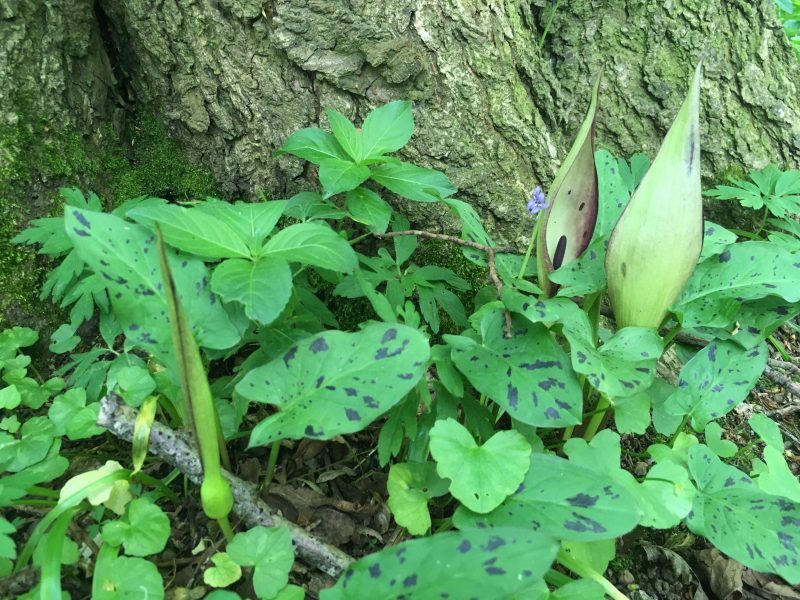 This newly planted forest with pockets of ancient woodland is an impressive project created by the Woodland Trust. 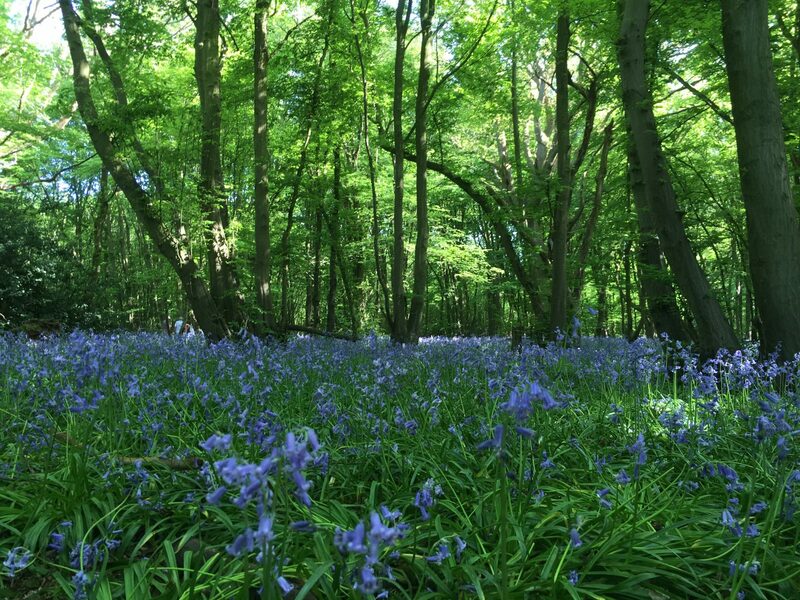 We visited Heartwood at the start of May and were rewarded with carpets of bluebells in Langley Woods, one of the ancient woodland areas. 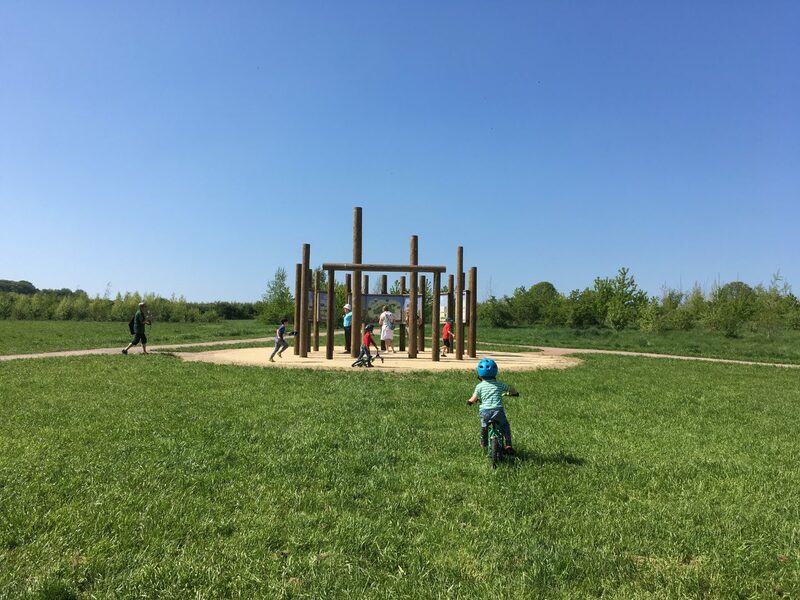 It is here that you’ll also find the den building area, which on our visit was packed with families picnicking in the shade of the oak and hornbeam trees. 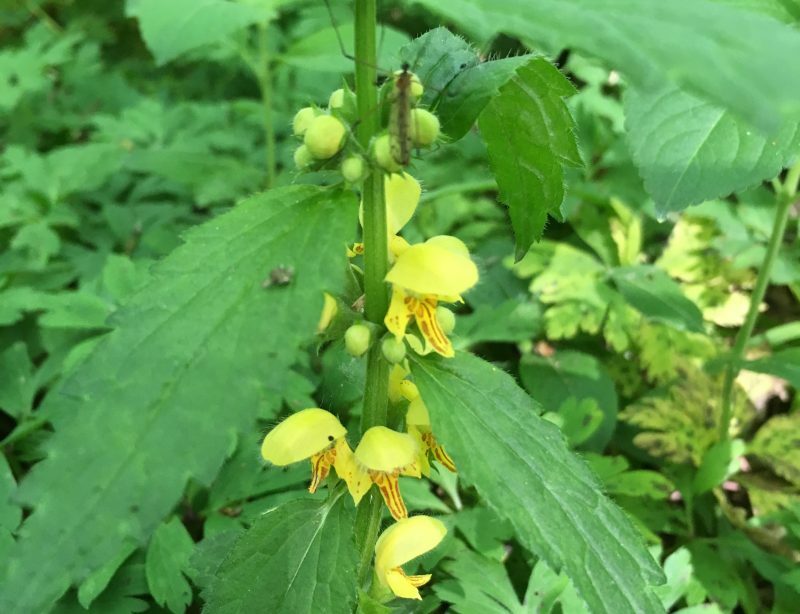 As well as bluebells, we spotted a variety of other wildflowers including elegant Lords and Ladies, Yellow Archangel and Stitchwort. 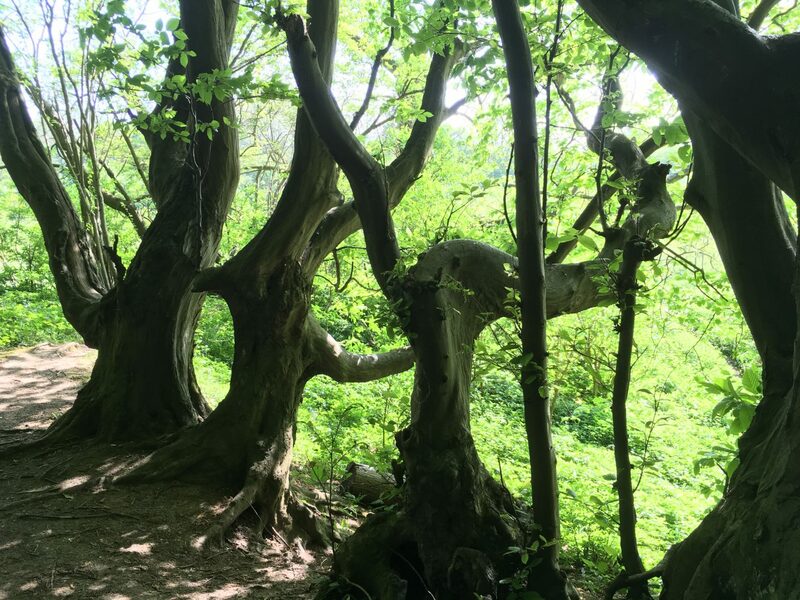 There were some brilliant mature trees in Langley Wood, we particularly liked a stand of hornbeams which looked like a group of ghostly figures. 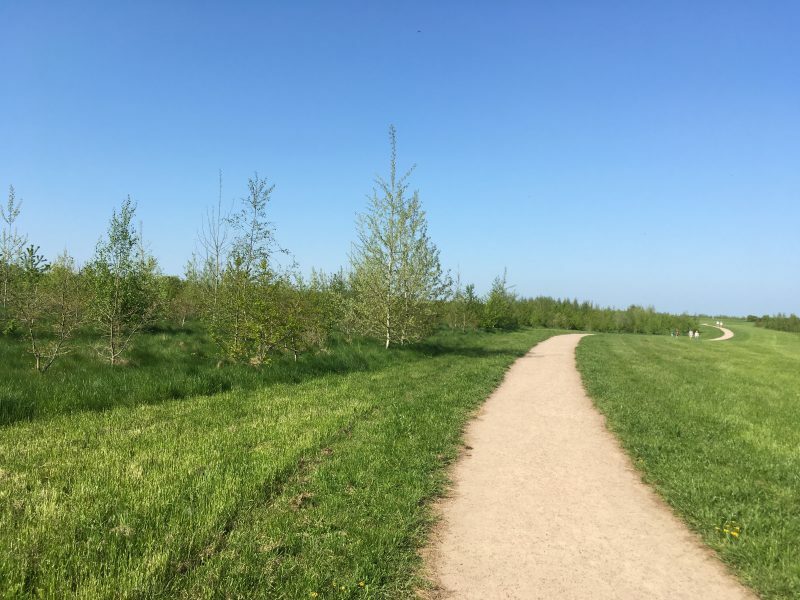 Thanks to thousands of volunteers over the last ten years, Heartwood Forest has been transformed from what was predominantly arable land into a 347 hectare site with over half a million newly planted trees. 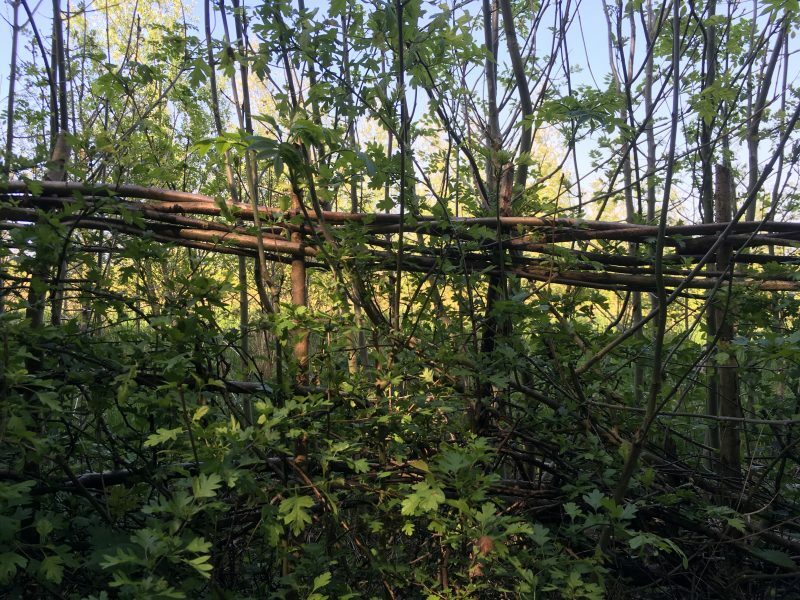 The Woodland Trust has also created new hedgerows to provide an important habitat for wildlife. Heartwood has walking trails for all abilities including paths suitable for buggies and wheelchairs. There are bridleways for horses and bikes are also welcome. 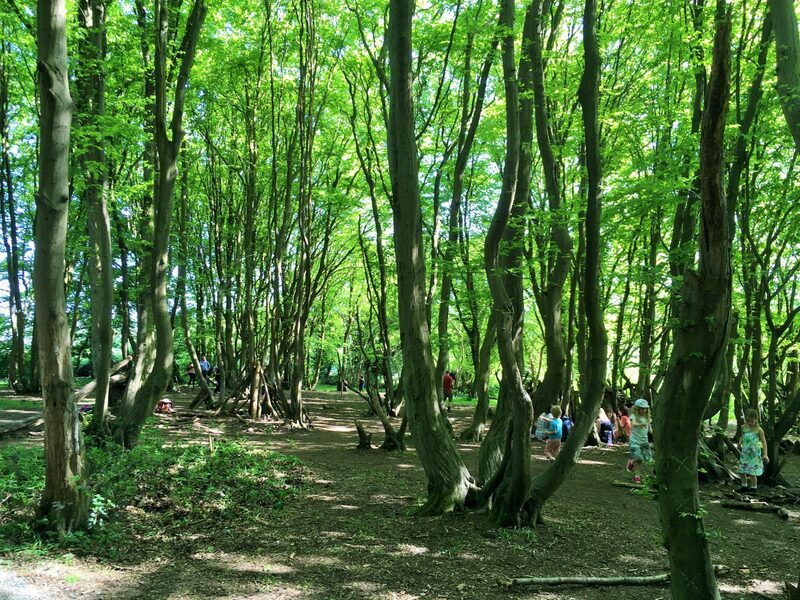 Aside from Langley Wood, children will enjoy the 1.5 mile Magical Meander through one of the new woodland areas. Along the way you’ll spot carved wooden creatures, reflecting the range of wildlife at Heartwood. 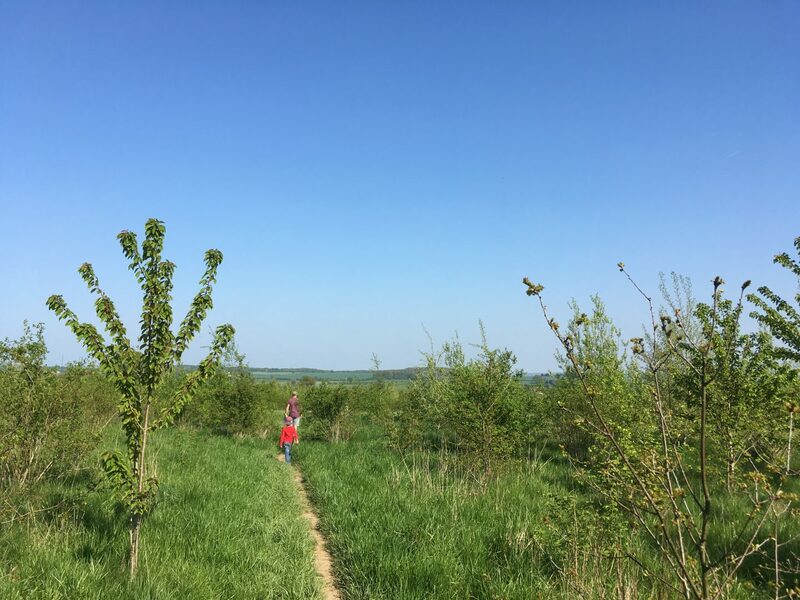 Heartwood features a community orchard which includes old local varieties of apples and pears plus an arboretum containing all 60 native UK tree species. 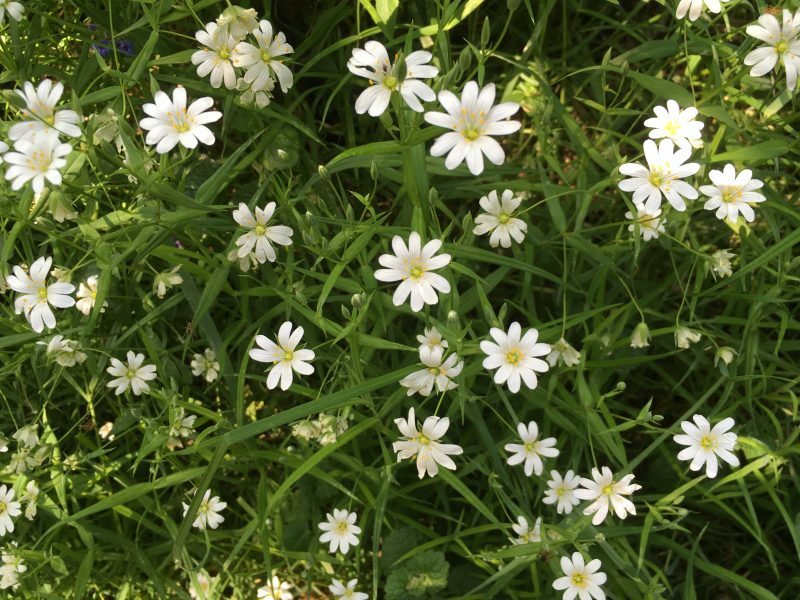 I’m looking forward to returning to Heartwood in the summertime to see the wildflower meadows, I’ve seen some lovely photos on Instagram of cornflowers (my favourite), oxeye daisies and poppies amid the tall grasses. 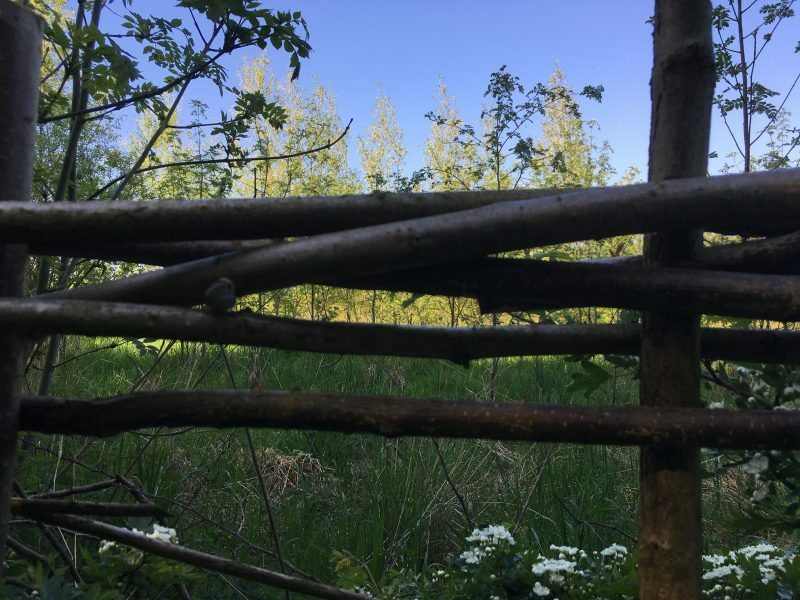 There are plenty of events planned by the Woodland Trust to entice visitors to Heartwood including guided walks, children’s activities such as nature detective experiences plus a summer festival. Refreshments: We haven’t eaten out in this part of Hertfordshire but the pubs in the surrounding villages look very appealing. Otherwise, Heartwood is perfect picnicking territory. 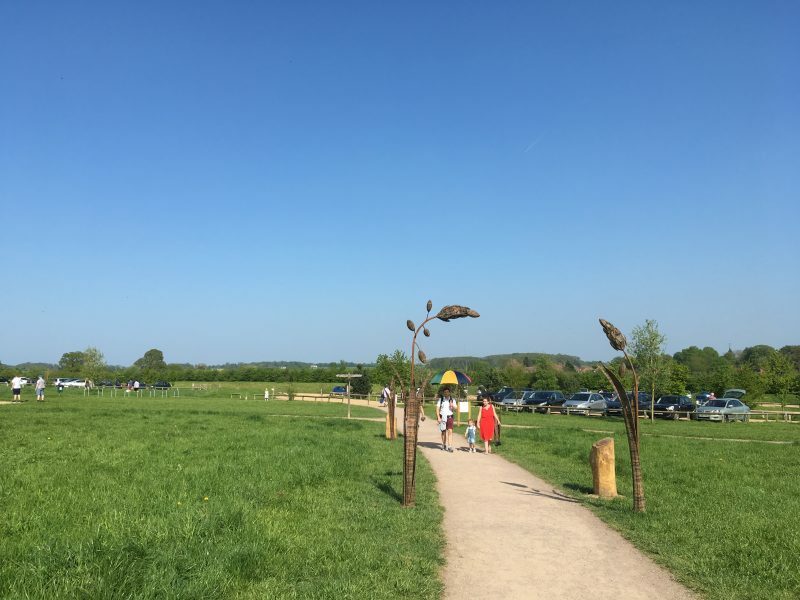 Parking and transport: Heartwood Forest is 4km from St Albans train station (20 minutes from London), otherwise there is a large car park at the forest (postcode AL4 9DQ) and further parking (plus toilets) in nearby Sandridge village. I think it’s brilliant that they’ve created a new wood. Ok, it might be a busy visitor attraction, but if it gets people out and interested in nature, then that has to be good. Beautiful pics! Thanks. Yes, I agree it’s definitely a good thing. And there’s plenty of reasons to visit al the year round. It’s such a great project, I’m looking forward to returning over the next few years to see how it evolves. Yes, really easy to get to if you put bikes on the train. I hope it proves popular this summer. Interesting how we use such different words to describe the same thing! What a lovely way to enjoy a family day out at this time of year. It looks very well organised with the trails there and plenty of space so it doesn’t feel too busy. I must say visiting with the bluebells out makes the woodland look so pretty and what child can resist a den building opportunity. You remind me that we could do with some new branches in our den building area. It’s a great spot, and good to see so many people using it. A shame St Albans is so far from me as this sounds like a perfect home ed day out for us. I must make time to just take them to the foret. 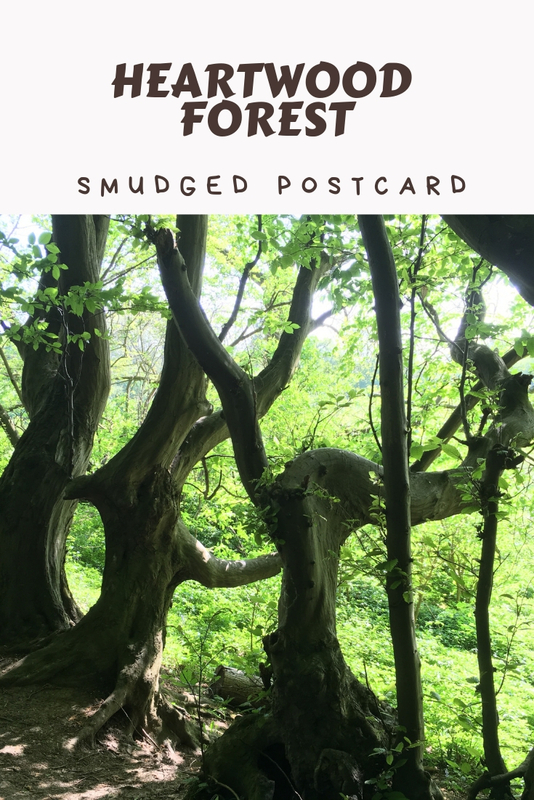 Check out the Woodland Trust website, really useful resource. You’ll have to return for a visit some time! What an absolutely stunning forest! We don’t really get anything like that near us in Glasgow. I could imagine Robin Hood and his merry men about those grounds.. The lords and ladies look completely different by the end of summer, they have bright red berries on, quite a transformation! The dens are great, there were so many children there when we visited! 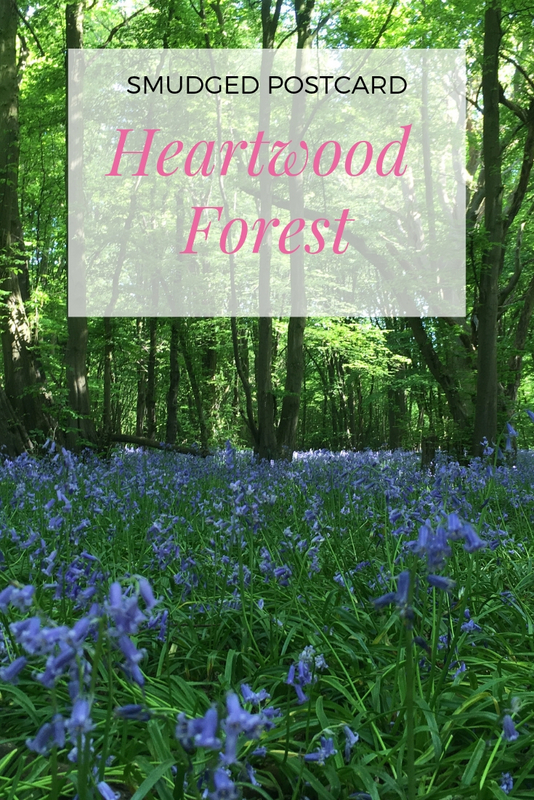 Anyway, Heartwood sounds like an amazing day to immerse into nature. I love that they also have a community orchard, I do love projects that bring people together along with food. I agree, I’m looking forward to learning more about the orchard as it grows! Thanks. Yes, it’s such a fun thing to do with kids. Although my boys prefer using ones that have already been built! 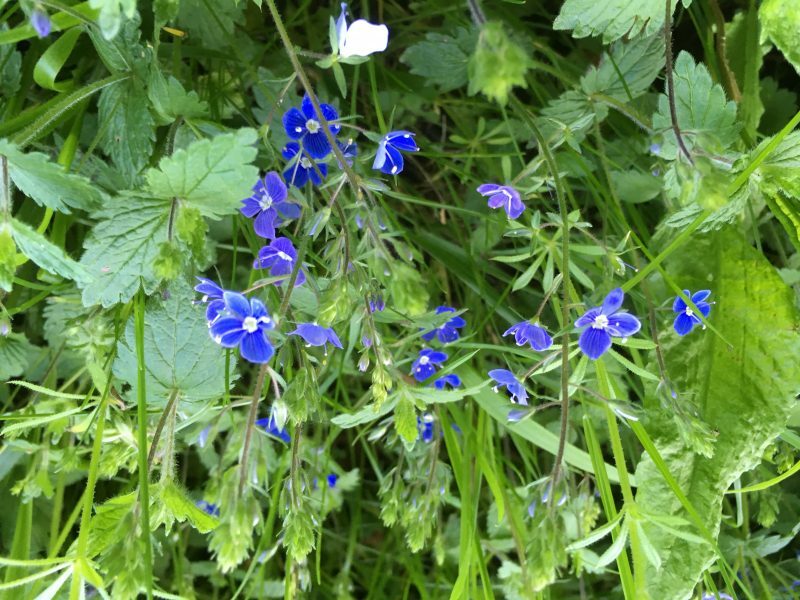 You had me at the bluebells! 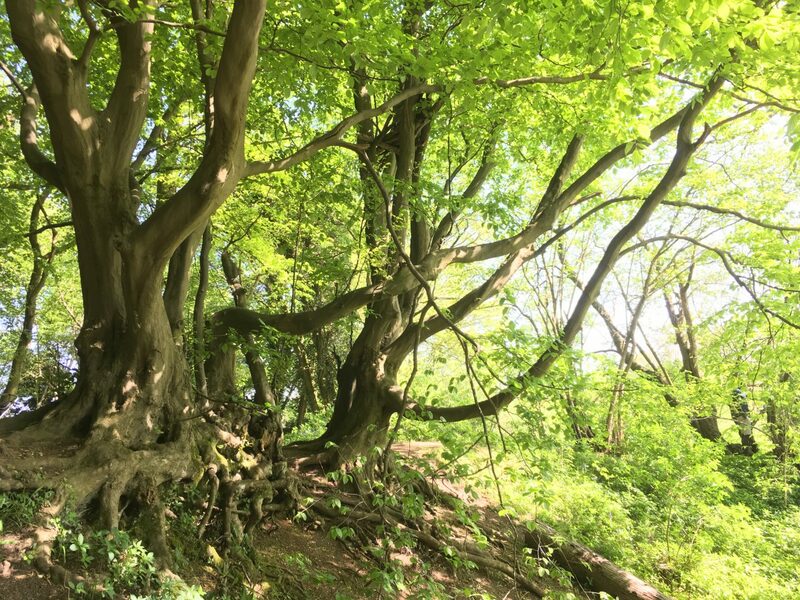 I also love those hornbeam trees – how gnarled and beautiful they look! This place looks like a real wonderland, well done Woodland Trust for all the conservation and replanting. Yes, it’s an amazing project with so many people involved. I had never heard of den building. This is the perfect spot! I would really enjoy this. 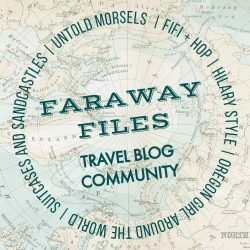 How fun for kids, too! 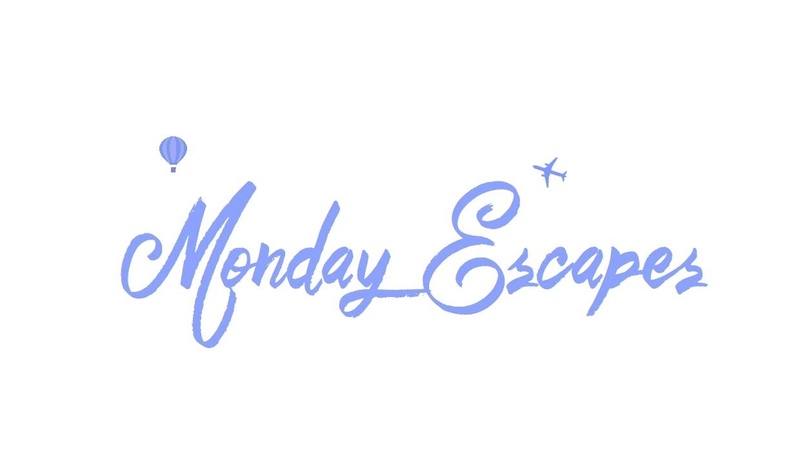 Looks like a great adventure and perfect place to wander. Kids love this kind of thing and me too! I agree, it’s definitely a sign of the times that we now have advertised spaces for things like this. 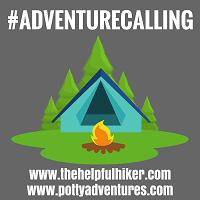 That said, and I completely agree again, anything that gets kids exploring the outdoors should be celebrated. What an achievement too, to develop this vast woodland from its previous arable state. Thanks for joining us on #adventurecalling . We open for new posts again tomorrow morning. Yes, it’s an impressive accomplishment. I’m looking forward to returning!